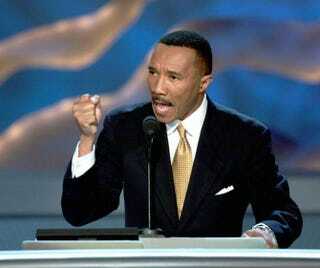 Kweisi Mfume speaks at the 2004 Democratic National Convention at the Staples Center in Los Angeles. The Hillary Clinton campaign announced Monday that former NAACP president and current Morgan State Chairman Kweisi Mfume is backing her for president, according to the Baltimore Sun. Mfume, 67, is a former Baltimore City councilman and represented Maryland’s 7th Congressional District from 1987 to 1996. He led the NAACP for eight years after that. There are rumors that former NAACP head Myrlie Evers will endorse Clinton this week, too. Benjamin Jealous, a more recent president and CEO of the NAACP, endorsed Clinton rival Bernie Sanders last week and has been stumping hard for the Vermont senator in South Carolina, where a closely watched primary will go down this weekend. On Tuesday, Clinton will campaign with Sybrina Fulton, Geneva Reed-Veal, Gwen Carr, Maria Hamilton and Lucia McBath—all mothers of victims of police brutality who have endorsed her, according to a BuzzFeed report. Read more at the Baltimore Sun and BuzzFeed.